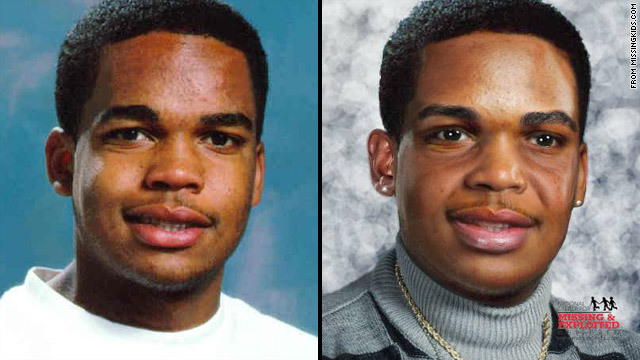 Byron Page was 17 when he disappeared. At age 35, he might look like the age-progressed photo on the right. Know something? Call 1-800-THE LOST or the L.A. County Sheriff at 323 890-5500. New York (CNN) -- On a Tuesday afternoon, 17-year-old Byron Page drove the family Volvo around Los Angeles, California, with his mother. Byron, who was preparing for his driver's test, was excited about this rite of passage and his other pursuits -- writing, sports, his first real jobs and college. But the next day, January 29, 1992, Byron was nowhere in sight when his mother, Jettie Page, came home from her job as a nurse. Page said she called a friend of Byron's who said he had seen him that day at a nearby city bus stop. According to the friend, Byron said he was going to a music and video store about 20 miles away in West Hollywood, a journey he made fairly regularly. By 7 p.m., Page and Byron's father had called the Los Angeles County Sheriff's Department to report the teen's disappearance. Responding officers took a report but said they could not do much for the first 24 hours. "I am inclined to think there is not as much of an emergency if a 17-year-old is missing than if a 5-year-old is missing,'' Page said. Byron had never hinted he wanted to leave home and he was not considered a runaway, said Det. Diane Harris of the Los Angeles County Sheriff's Department. The younger the child, the more of an emergency. His clothes, treasured comic books and the money he saved from a recent ski trip were left behind at home. Over the years, many false sightings were reported across the country, Harris said. A CNN.com request for an interview prompted Harris to enter Byron's information into namus.gov, a Department of Justice database for missing and unidentified persons. In the early hours, Byron's parents drove around Los Angeles to search for their son and made fliers with his photo and basic information. They found his phone book and called all his friends. "As you can imagine it was a devastating experience for all of us,'' Page said. Page recalled the especially painful experience of going to Byron's high school and taking home the contents of his locker. Acceptance letters in the mailbox from schools in the University of California system brought more sorrowful moments, Page said. Byron's brother, who was a student at the University of California's San Diego campus, wanted to drop out to help search. His parents persuaded him to stay in school, Page said. Byron loved soccer. He had played since kindergarten, Page said. He tried football in his sophomore year of high school but it was too ''rough and tumble'' for him. He returned to soccer, much to his mother's delight. Byron wanted to be a writer. He got off to an early start in high school. This ... reaffirmed my belief that through hard work and dedication one's goals can be achieved. He wrote about comics with a critic's point of view. Page kept a review he submitted to a magazine, which sent him a cordial and encouraging rejection letter. Byron also mentioned being a camp counselor at a local YMCA, a work experience program at the Los Angeles International Airport, making the honor roll and his five-semester perfect school attendance record. Byron added that his PSAT score was among the top 6 percent of black students who took the exam and qualified him for an academic college scholarship. "This pleased me and reaffirmed my belief that through hard work and dedication one's goals can be achieved,'' Byron wrote. At the time of his disappearance, Byron was 5 feet 8 inches tall and 160 pounds. He was wearing a blue and white jacket and blue baseball cap. Byron would now be 35. If you have information on Byron's disappearance, call the National Center for Missing & Exploited Children at 1-800-THE LOST or the Los Angeles County Sheriff's Department at 323 890-5500.